This is one of a kind event of the year! Bringing both successful and aspiring women sounds pretty amazing! This is an event where hope and dreams are put together and turning it into reality. This will be a success! Girl power rocks! 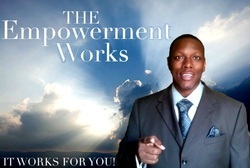 The Holy Spirit allowed a wonderful program Empowerment Works (on FB). I've met with the gentleman Marvin Roane and I highly recommend this program to you! ! ! ! Seriously, we need to talk. EVERY woman needs to go thru sessions with this GOD sent program! I've been where you are. . . I am coming out. I asked Mr. Roane for a description of his program in hopes that what it had to offer would help my son in school as well as in life. He began to tell me what he had to offer and the more he talked the more I felt that this was something I desperately needed for myself. Mr. Roane had given me a packet with all the information and the more I read it, the more the words seemed to jump from the page at me. I was so filled with emotions I had to literally fight back tears from rolling down my face. I don’t know why I reacted the way I did,…. correction…., yes, I do. I was ready for a change in my life and somehow some way, I knew this program was for me. The Empowerment sessions literally catapulted me into a state of mind that has laterally changed my life. Just like any challenges in life, you have to really want it, in order to receive what the program has to offer. I was like a child, thirsty for knowledge and I knew I had to commit 110% to the program in order make the necessary changes. The Empowerment program gave me the tools necessary to tap into aspirations, abilities, hopes and dreams that I never knew I had. Of course I had hopes and dreams before this program, but it went much deeper than the surface. The program has allowed me to discover some wonderful and amazing things about myself. Sometimes in life we need a little help, to help us discover who we really are, what we should be doing and to find and recognize our purpose in life. Thanks to Mr. Roane and this program I see the world much differently. I have a new lease on life and I welcome each day with peace and joy in my heart. I will say to you, if you have ever felt lost in some way or just feel as though the walls are closing in around you, I encourage you to check into this program. Keep an open heart, when you do, you will know immediately if this program is for you. It has been my pleasure to be a part of his “Empowerment Movement” for his community. His desire to transform his surroundings is sincere, infectious, and nearly comparable to a force of nature. He is a man who has also learned from past failings, whether personal or financial, and has used them to move forward instead of wallowing in self-pity (this is the gospel according to Marvin). While he may not be a perfect man, he is a man perfect for recognizing how we must all allow ourselves to grow through self-improvement and self-analysis. His is the commitment to “the greater good” of us all, and this is quality we must latch on to (and appreciate) before it is totally consumed by this current climate of selfishness and escapism. If you have the opportunity to become connected with Marvin, whether personally or professionally, it is a decision you will not regret because his heart and aims are true. At the end of the day, we are all looking for someone who will consistently walk that road of life with us to the destination of truth (and Marvin is that someone, who will walk the walk as well as talk the talk with you). Mr. Roane is a dedicated family and business man. He is a highly focused self-motivated individual who always looks for ways to improve himself and his surroundings. He has demonstrated excellent communication and organizational skills. He is a true leader, and most of all he is one of the best, if not the best person I have ever come across in teaching, mentoring and guiding youth. The positive development of young people is truly his first love. Mr. Roane demonstrates excellent communication and organizational skills. This allows him to clearly hear his clients needs and help guide them to positive life changing habits. I am writing in regards to Mr. Marvin V. Roane. I have personally known Mr. Roane for 20 years. His level of skill is of such caliber that he has been my own personal mentor and life coach. His effective teaching style is engaging and interactive. In my time with Mr. Roane, I have learned that he is an invaluable member of any team. He is a man of high integrity and impeccable character. He is a well spoken professional who is able to think and react from an intuitive sense of ethical values. He is an exceptional motivational speaker whose skills are greatly valued by those he serves. He creates strong therapeutic relationships and builds rapport with his clients to help bring about growth and healing. I am impressed by his enthusiasm, passion, and the dedication of his life to helping others. He is definitely a people person who is concerned about individuality and group dynamics. Mr. Roane loves to bring the best out of people and help them to empower themselves. His daily blog Empowerment 365 involves his inspirational and informative insights as to personal growth and life management skills. I highly recommend him in any capacity. He recognizes that “excellence is a journey, not a destination” his commitment to this mindset will help foster a sense of well being and mental prosperity to the development of each client’s growth. If you want a professional who will bring originality, creativity, interpersonal skills, and leadership, look no further than Mr. Marvin V. Roane. Mr. Roane is one of the most loyal, dedicated, and professional people I know. In the time that I have known Mr. Roane, he’s shown a continuance to strive for excellence in all of his professional duties. Mr. Roane is responsible, dependable, and works well with the community and other agencies/organizations. Mr. Roane is passionate about others having an opportunity for success. Mr. Roane has a natural talent for working with individuals or group who come from diverse backgrounds and a natural talent for creating programs that renders positive outcomes. His programs are designed to provide his clients with the necessary training to maximize their potential and to assist in obtaining true independence and self-sufficiency. The programs are also designed to assist his clients in knowing how to and become willing to do self evaluations that will help them make sound decisions towards reaching their goals. Well trained and taught in the areas of Self and Personal Development, as Director of Empowerment Works he has touched the lives of thousands. His Empowerment Workshops, Sessions, Conferences, Group Settings and Personal one on one sessions have transformed lives beyond measure. I feel your Staff Development Session was very beneficial and I thoroughly enjoyed it.